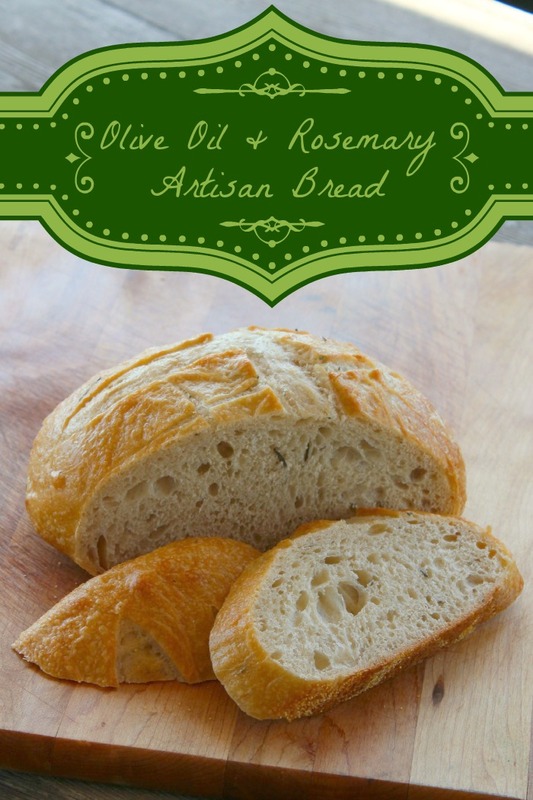 This Olive Oil and Rosemary Artisan Bread Recipe is one of my favorite bread recipes. It’s rustic profile is visually appealing and the flavor is to die for. It makes a great bread for a dinner that has a meat entree so this is what I am planning to go with my Slow Cooker Ham Recipe for Easter. Not only will it be delicious but it will add to the beauty of the Easter tablescape. I don’t know what it is about homemade rustic artisan bread but it has a real appeal for men in my family. I will have to secure the loaf in an undisclosed location until dinner time or I will find some of it missing for sure! 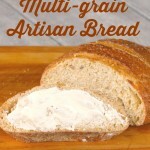 This artisan bread recipe is something I can bake the day before. I love getting as much of the prep work for a holiday meal done ahead of time. Easter is a particularly busy one because we go to church and have dinner when we get home. Nobody in my family has the patience to wait for hours while I get dinner ready so I have to have a plan. I precook as much as possible and reheat things like veggies and sides. Home baked bread is not difficult and I don’t understand why the younger generation shys away from it and opts for commercially produced bread. All you need is a sturdy stand mixer (I have my 27 year old Kitchenaid) and a little time. If you work all week, do your baking on the weekend. It doesn’t take much more than 15 minutes to pull the dough together, then you let it rise on its own checking it once in the process. Then pop it in the oven. Baking the bread only requires about 20 minutes of your time and what a wonderful aroma fills your home when it is baking. 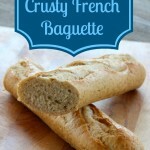 Try it once and you won’t ever want bread from the store again! To make this recipe, you’ll need 3 pieces of cookware – , a cookie sheet with no sides, a metal 1/2 sheet, and a pizza stone. You can make it without a pizza stone, using a cookie sheet, but the pizza stone cooks it very evenly. 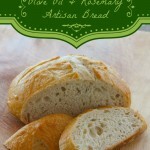 Try this Olive Oil and Rosemary Artisan Bread Recipe and give the family a real treat. Baking your own bread is not as difficult as you might think! Combine the water (warm), yeast, and sugar in the “pre-warmed” bowl of your stand mixer. The water should be 110-120 degrees. Stir until the yeast dissolves and set aside until the mixture becomes bubbly. It will take about 10 minutes.This step is called “proofing the yeast” in “baker -speak”. In a separate bowl, combine the salt, pepper, rosemary,and 2 1/2 c. flour. Pour olive oil into the wet ingredients, and start the stand mixer (with dough hook attached) to mix. Add the flour mixture 1/2 c. at a time, and continue mixing until the dough forms a ball, clinging to the dough hook and has pulled away from the side of the bowl. Continue to knead with the dough hook for 5 minutes. If the dough stays sticky, add the additional 1/2 c. of flour. Place the dough in a greased bowl (I use glass or ceramic not plastic). Cover with a damp towel and place in a warm, draft free place until it doubles, about 1 hour. Punch the dough down, and turn out on a floured surface. 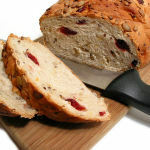 Shape it into a round or oval loaf. Put a piece of parchment paper on a flat cookie sheet (no sides) and sprinkle it with corn meal. Place the loaf on the sheet: cover, and let rise to double once again. Place your pizza stone in the oven on the middle shelf, a half sheet pan on the bottom shelf, and preheat to 450 degrees. When the dough is done rising carefully remove covering, and carefully make a 1/4″ deep cut with a sharp knife across the top of the loaf for decorative appeal (if you want). Gently slide the loaf on the parchment paper, onto the pizza stone. Add 1 cup of water to the half sheet pan on the bottom rack (this will create stem in the oven that will make for a crispy crust). Reduce oven temp to 400 degrees. Bake for 20 minutes and then check it, The top should be golden brown. Tap the loaf, you are looking for a hollow sound which will indicate it is done baking. If not done, put in for 5 mins more and check again. If you enjoyed this recipe, you might like some of my other yeast bread recipes – visit my homemade bread recipe collection by clicking here. My first loaf of bread using a KitchenAid stand up mixer – the recipe you shared did not disappoint. Delicious; soft texture with a delightful hint of rosemary and olive oil. Thanks for the posting the recipe. Glad you enjoyed it. I love baking bread and that aroma is heavenly! Hi! Stopping by from the Home Matters Linky Party! This just looks so..YUM! Thanks for sharing! It tastes just as good as it looks. So savory and delicious and the rosemary is subtle not overwhelming. Oh my hubby LOVES rosemary bread. I will have to make this for him! The irony in my husband’s family is the older generation buys store bought bread, while I definitely prefer homemade. And this combination sounds fabulous.